Hi, my name is Dr. George Seabroke. I am a Research Associate at MSSL working on the European Space Agency’s Gaia mission. My main research interest is how stars move in our Galaxy, which will be the topic of a future blog. 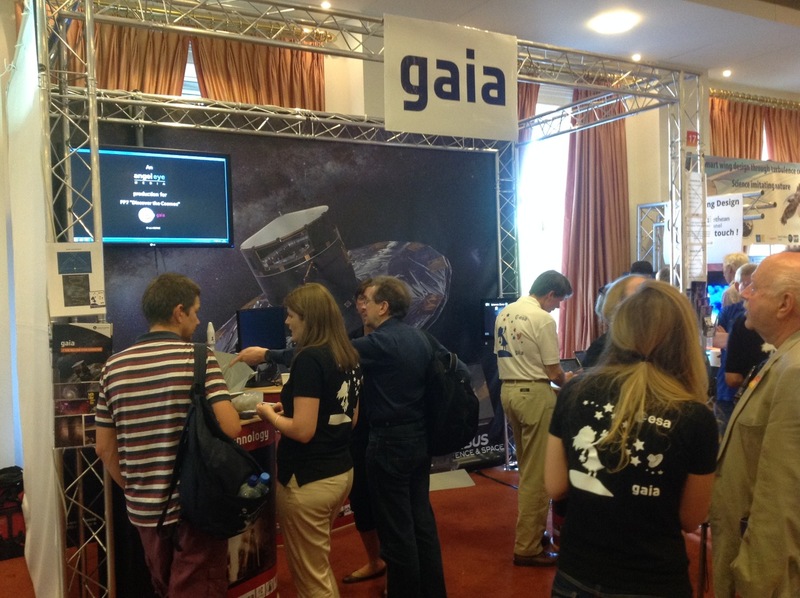 However, today I would like to talk about representing Gaia at the Royal Society Summer Science Exhibition 2014. 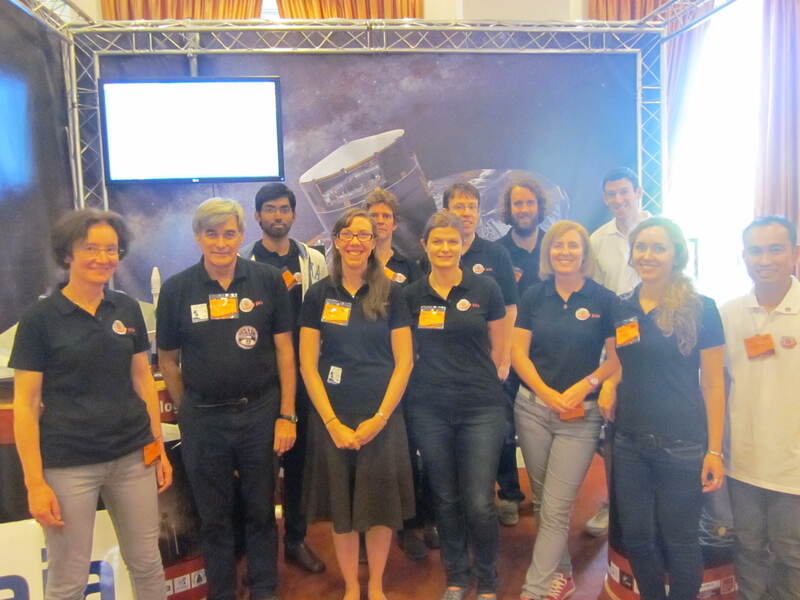 MSSL was well represented at the Royal Society Summer Science Exhibition 2014, which ran from Monday 30th June to Sunday 6th July at the Royal Society in London: four Astro group members and the head of the software engineering group were “explainers” on the Star Tracks (Gaia: mapping the Milky Way from space) exhibition while members of the Planetary Science group were explainers on the Catch a Comet (Rosetta) exhibition. The Astro group members were Prof. Mark Cropper (Head of Group and MSSL Gaia PI), Dr. George Seabroke (Gaia Data Flow Scientist and MSSL Scientific Lead, see Figure 1), Dr. Daisuke Kawata (Lecturer in Astronomy with Gaia-related research interests, see Figure 1) and Megan Whewell (PhD student and outreach specialist). These three were joined by Steve Baker (MSSL Gaia manager). Gaia’s launch on 19th December 2013 was a topic of a previous MSSL Astro blog by Mark. The MSSL Gaia group was part of the team around Europe that successfully commissioned Gaia and in particular the Radial Velocity Spectrometer (RVS) instrument onboard Gaia (read more about it here). Commissioning finished around the time of the Exhibition. It was a welcome reward to present Gaia to the public, after all the hard work of commissioning! Figure 2: “Gaia the machine” podium – see text for details. 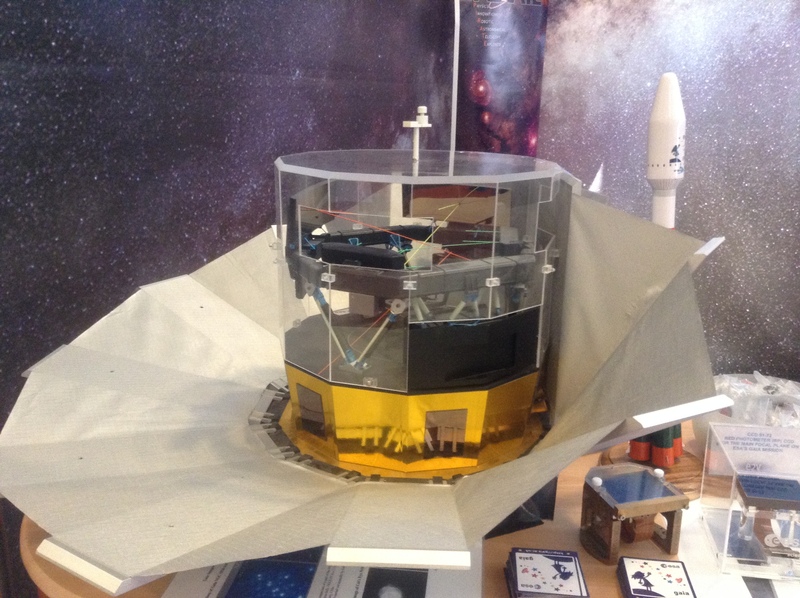 1) Gaia the machine, where the message was “amazing technology for an amazing mission!” Figure 1 shows a 1:20 scale model of the Gaia satellite, kindly lent by Airbus DS, the company that built Gaia. Behind it one can see a model of the Soyuz rocket that launched Gaia into space. For launch, Gaia was in the top part of the rocket surrounded by a “fairing”, which had a logo on, some of which you see in the photo. The blue squared objects, one in a handling jig and the other in a Perspex box, are not models but real Gaia CCDs made by e2v that were not selected to go on the satellite (all the CCDs that were selected to go on the satellite were tested at MSSL, along with their associated electronics). Behind the Perspex box is a bowl of ESA Gaia badges that were handed out. Other freebies that are visible on the table are the stickers and fridge magnets with the Gaia fairing logo. Below the satellite model, just visible, are first light images from Gaia during commissioning. The backdrop to the stand is, of course, the Milky Way, showing just some of the billion stars Gaia will measure. Figure 3: “Gaia alerts” podium – see text for details. 2) Gaia alerts, where the message was “you can be part of Gaia!” In Figure 3 the suspended screen shows the Open University’s robotic telescope PIRATE on Majorca being remotely controlled by Dr Jo Jarvis. PIRATE is part of a network of ground-based telescopes that will follow up Gaia alerts. Gaia will see the same object on average 70 times during its five year mission and will detect if objects change their brightness e.g. supernovae. Gaia may not see the same object for a while (as it surveys other parts of the sky) and such phenomena require prompt follow-up observations to determine their nature so alerts are being generated from ground-based processing of Gaia data and published online. This will allow anyone with a telescope (professionals and amateurs alike) to follow up Gaia alerts and be part of Gaia! See here for more information. 3) Star tracks, where the message was “stars move!” Figure 3 shows three tablets on the Star Tracks podium loaded with interactive games. One illustrated the Sun’s orbit around the centre of the Milky Way and how it would change if our Galaxy’ mass and gravitational potential were different. MSSL has written much of the Gaia on-ground data processing software that will measure line-of-sight radial velocities from Gaia-RVS spectra. In combination with other Gaia data, this gives the 3D space velocity of stars. The 3D space velocities are required to compare to models, much more sophisticated than those on the tablets, to infer our Galaxy’s mass and gravitational potential more accurately than before, thereby better constraining the nature of dark matter. Over 14,000 people visited the Royal Society Summer Science Exhibition over the seven days. On the weekend, over 5000 people visited. We felt like we had spoken to a large number of these people at the end of each day! It was a fantastically rewarding experience, seeing people’s amazement as we explained Gaia to them, especially inspiring all the school children. 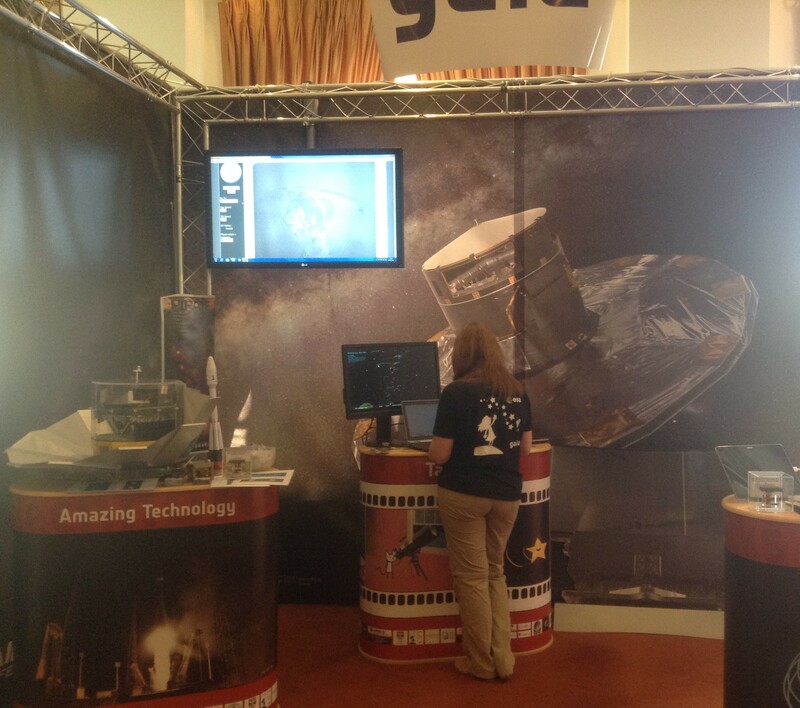 Thank you very much to everyone who visited us and to the Gaia exhibit organisers and the Royal Society for a great event! If you missed Gaia (or the freebies!) at the Royal Society Summer Science Exhibition, fear not, as we are doing it all over again at the British Science Festival in Birmingham on Saturday 6th September (visit us here). The Gaia exhibit will also feature at MSSL’s Open Day on Saturday 13th September (the event is free but booking is required).